This weekend does not promise to be easy for head of the Palestinian Authority and Fatah leader Mahmoud Abbas. On Monday evening, tension was escalating in the Gaza Strip and concern over the fate of the frail ceasefire between Hamas and Israel was beginning to be expressed. “We have been keeping our part of the deal, but Israel is not keeping its part and we don’t want tension to get high because when it does there is no telling what would happen,” said a Hamas member in a telephone conversation. According to this source, Israel is breaching security commitments it has made, and these breaches are increasing. Israel had targeted and killed Palestinian protesters over the border with Gaza as they marched against the Israeli occupation and the siege Israel had been imposing on the densely populated and greatly impoverished Strip for over a decade. The Gaza Strip, too, has been readying itself along with other occupied Palestinian territories in the West Bank and East Jerusalem for a possible long strike to protest a recent Israeli law that pronounces Israel as strictly a homeland for Jews. “It does look very tense, it is true. We are always trying to keep tension under control and we are hoping that all the Palestinian parties would cooperate with us and show the necessary wisdom to spare the Palestinian people from further suffering. We are talking to Hamas and Fatah,” said an Egyptian official. The Egyptian official would not say if talks would include Abbas whose relations with Cairo have been plummeting over the past few months. Abbas, according to the Egyptian narrative, “is not being realistic” about what to expect from Egypt in terms of supporting Palestinian demands. Cairo is also arguing that Abbas is failing to be helpful in working along with an Egyptian initiative to end the decade and more feud between Hamas, that took over and been unilaterally governing Gaza since the summer of 2007, and Fatah that has become increasingly isolated from Gaza in the West Bank. According to this Palestinian official, based in the occupied territories, and Palestinian diplomats speaking from outside the occupied territories, Abbas is being let down “almost by everyone”. Some Arab capitals, according to the argument of those representing the PA, have been “going too far in pressuring” the Palestinian president to succumb to “Israeli proposed and US packaged ideas” for a deal that is currently being drafted by Jared Kushner, aide and son-in-law to US President Donald Trump. This “deal”, PA sources say, would leave the Palestinian people with only “sporadic territories with a very meagre semblance of statehood”. Repeatedly, PA officials have been complaining about the “Arab posture on the Palestinian cause”, which they say is far from upstanding. Last week in New York, on the fringes of the UN General Assembly, Abbas lamented declining Arab support for the Palestinian cause. According to one diplomatic source who spoke from New York, Abbas is not just complaining about limited political support, but also decreasing economic support, which he says is making life harder for the Palestinians. Speaking to the UN General Assembly last Thursday, Abbas said there would be no peace without a truly independent Palestinian state with East Jerusalem as its capital. Jerusalem and the entire Palestinian cause, Abbas added, is not up for grabs and cannot be subject to political compromise. Meanwhile, Abbas appeared to be sidestepped on the diplomatic front. Most of the meetings that he would have normally held with Arab delegations during his regular participation in UN General Assembly were cancelled. “Instead of meeting with Abbas to express support for the Palestinian cause and to decry ongoing Israeli violations of the basic requirements for peace, Arab delegations preferred to meet with Israeli Prime Minister Binyamin Netanyahu,” a PA source who joined Abbas in New York said. Worst still, he added, almost all Arab delegations declined to support Abbas in his request for an international mechanism to overlook the “sad fate of the peace process”. “We have had enough of the Americans. This administration had topped all the rest in being openly biased to the Israelis. Trump moved the US Embassy to Jerusalem and closed down the office of the [Palestine Liberation Organisation] in Washington. Why should we be listening to anything he has to say, and why should we have faith in anything he has to offer?” the PA source added. “Still, they keep telling us we have to show some interest in what the Americans are offering and to build on it, and we keep telling them that there is nothing there for us to build on,” he complained. Speaking of some Arab capitals, the source said: “They cannot see that [Abbas] cannot agree to a deal that would be totally rejected by all Palestinians irrespective of their disagreements. They insist that he is playing a political game to stay in power, but in fact he simply cannot agree to a deal that gives the Palestinians much less than a defunct Palestinian state. Neither did Abbas get much support from EU member states who have otherwise upped their contribution to the budget of UNRWA but have failed to project sufficient political support, including from those who had earlier promised to move towards recognition of Palestine as a full-fledged member of the UN, with or without the Israeli consent. In New York, the PA sources say, Abbas knew that the time of international and Arab attention to the Palestinian cause has gone, and that the accent is now put on issues related to stopping migration to Europe and combatting terror groups in the Middle East. In addition, topping the agenda is criticism of Iran something that brings together many Arab states, Israel and the US. The ordeal of Abbas, however, is not just external. Abbas faces serious inter-Palestinian discord, with Hamas leaders openly suggesting that he does not represent the entire Palestinian people. 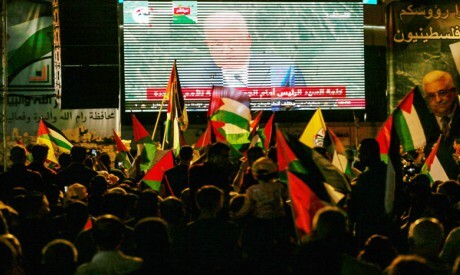 Hamas statements that used to be somewhat careful and low profile took a higher pitch as Abbas was heading to New York for the UN General Assembly. “How are we supposed to say that Abbas represents all the Palestinians when he is contributing to the economic stifling of the Gaza Strip to make political gains for Fatah?” asked the Hamas leader, who has for months been complaining about the failure of the PA to meet its basic financial commitments towards Gaza. Abbas has also to worry about growing inter-Fatah tensions on his succession. The bras de fer is already on, and while in New York he had to answer questions to international interlocutors about who would follow him, fissures within Fatah, tensions in relations with key Arab states and his notions for the management of the situation in Gaza if there were another war, and his efforts to stop a new Intifada in the West Bank should political tensions increase. * A version of this article appears in print in the 4 October, 2018 edition of Al-Ahram Weekly under the headline: Abbas stands alone in New York.